The 5th Grade Homeschool Bundle includes: Student Edition, MindPoint® Quiz Show CD-ROM, and Teacher Edition CD-ROM. Pearson Homeschool offers a wide range of curriculum for Pre-K through 12th grade, including the very popular, "Sing, Spell, Read, and Write"
Fifth-graders will acquire the tools and understanding necessary to succeed in middle school level math homeschool courses by learning to add, subtract, multiply, and divide with decimals, fractions, and whole numbers. 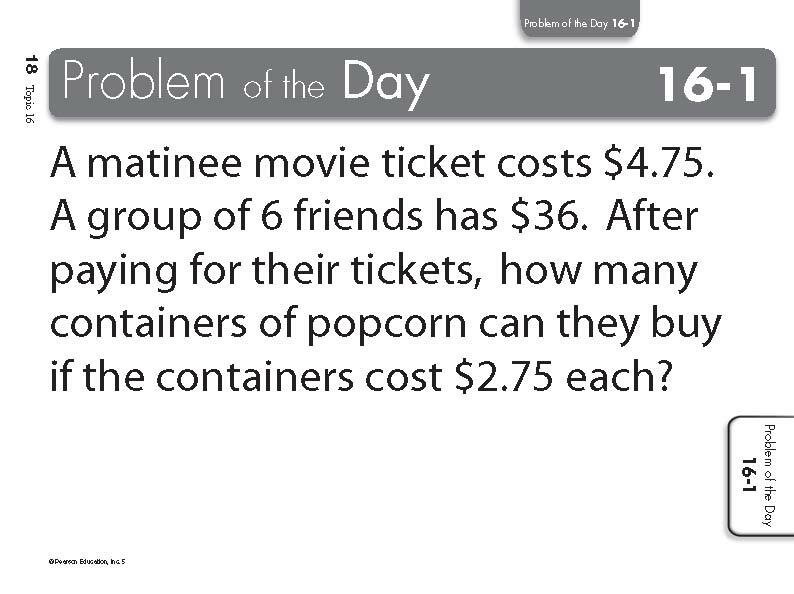 Your child will learn to use algebraic thinking to solve real-world problems with tables and graphs. They will learn basic geometric concepts that extend to ideas of length, mass, and volume. Hardbound student edition - "Visual Learning Bridge teaches math concepts step-by-step with purposeful, sequential illustrations while connecting learning activities and lesson exercises. Grades 3–6 hardbound edition expands visual learning with focus questions and pictures with a purpose, and students learn to express concepts in writing." MindPoint Quiz Show CD-Rom - "Multiple-choice questions in a game-show format give your students additional math practice. 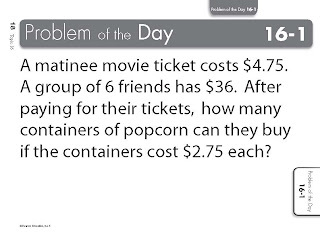 Ideal for students to play on their own or in small groups, or you can create teams and get the whole class involved. Macintosh/Windows Dual Compatibility"
Teacher Edition CD-ROM - "Contains the entire contents of the Teacher's Edition with easy navigation. Includes customizable lesson plans, teaching guides, reviews and assessments, and numerous printable resources in .pdf format all organized in a friendly, easy-to-use format. Macintosh/Windows Dual Compatibility"
Parent Guide - "This guide walks you through the program highlighting the main elements of the student and teacher materials and provides guidance on setting up your lesson plan, pacing, and adapting the curriculum to fit your family." 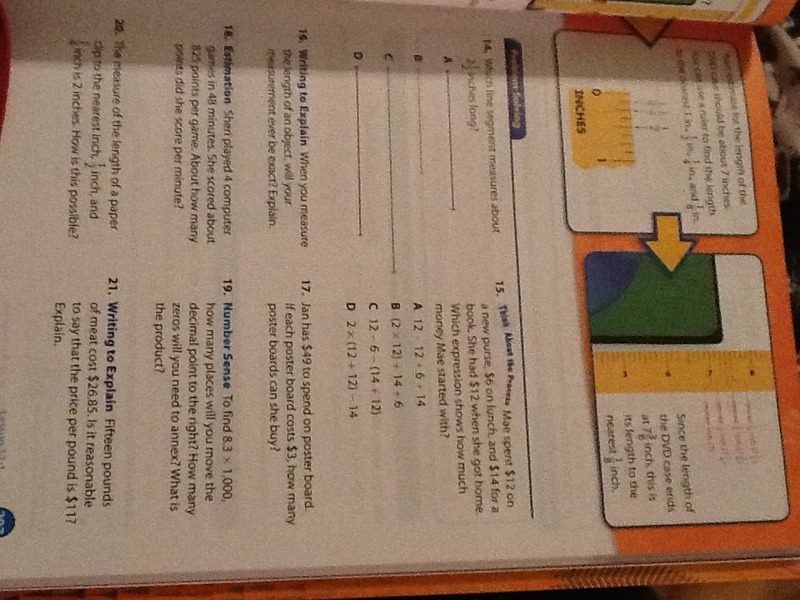 An optional Homework Workbook is also available for only $7.97. 1. The book is sturdy and durable. 2. 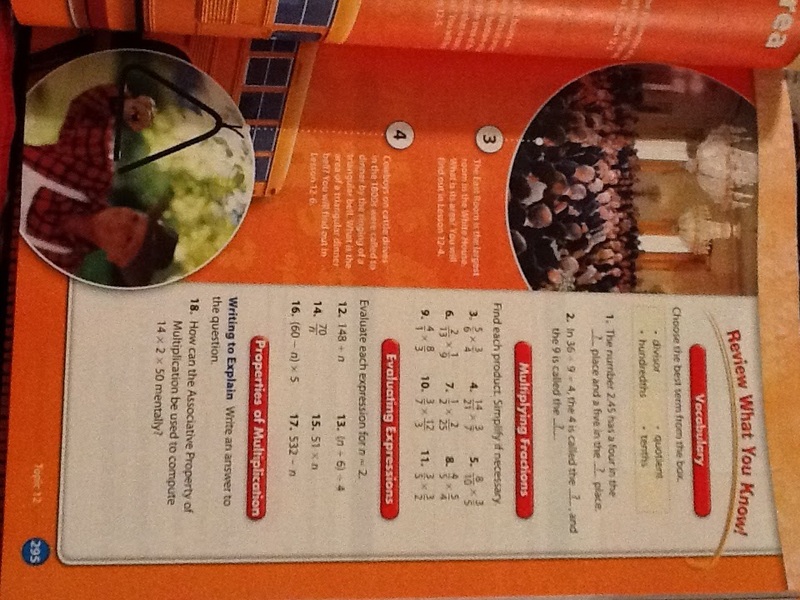 The textbook has colorful pictures and illustrated questions. 3. 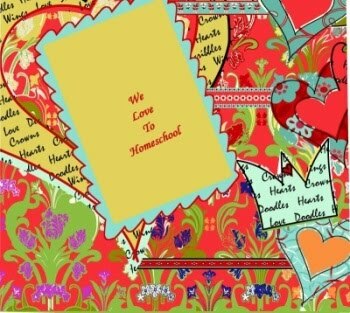 Each lesson has a nice and colorful explanation across the top of the 2 pages. 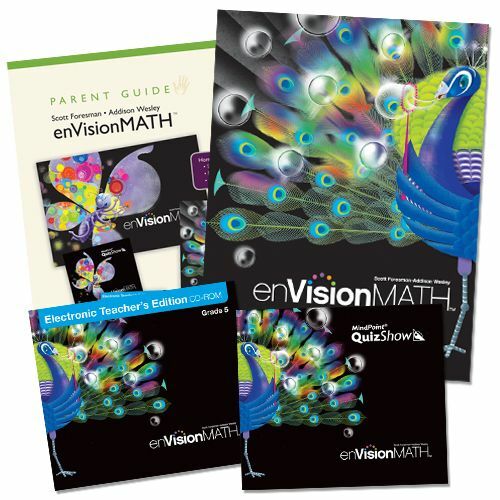 4. enVision 5 includes a problem solving handbook in the front, with many helpful tips for solving a variety of math equations/problems. 5. The lessons are broken up into reasonable segments. The explanation and examples, a chance to explain to make sure the student understands, a guided practice for the parent to get the child going (making sure they understand), and then independent practice. "To amend the Constitution of the United States, 2/3 of each house of Congress must approve the amendment. Is 7/12 of a house's approval enough?" 7. The tests state what lesson the skill was covered in. This is handy if you miss a problem and want to see why. 8. After each test is a reteaching section, for those areas that were neglected on the test. 9. The Parent Guide offers a helping hand for the parent on their homeschool journey. 10. The electronic teacher's edition includes lots of helpful resources for the teacher/parent, including answers and printables. 11. The Quiz Show CD is a nice addition for my daughter. Students can compete against the clock, against the computer, or against another student. My daughter is competitive, so she wanted to go quickly and beat the opponent (in our case, the computer). It includes topics from every lesson learned in the book. 12. My daughter would ask to use this book, instead of her regular program. 1. 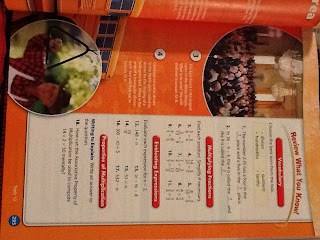 I would prefer a consumable textbook, versus writing the answers in a notebook. But some might prefer this route, since they can use the book again with other children. 2. I would prefer the option of answer key book, in adiditon to the teacher's CD. Because although the extra printables and such are a great supplement, I would rather not have to load the CD to check my student's answers. 3. The pages are a tad bit busy for me. But of course, if they spread it out more, the book would be thicker and heavier and more expensive. So I guess it is a trade off. Since my daughter will be 5th grade next school year. 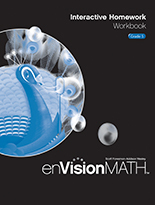 I plan to continue using the enVision 5 math bundle in the fall. For all ages, either as independent reading or as a family. Would you like a free issue? Check out this link (http://www.creationillustrated.com/TOS) and read about their offer. If you prefer to pay upfront, you will save $5 off of your subscription. Our purpose is to share the wonders of God's creation. By revealing fresh insights of His infinite wisdom, gentle touch, undeniable justice, redeeming love, and flawless design, pure truth shall bring renewed peace. Each part of this publication is offered as a reprieve from the daily rigors of life so that all can look to the future with unbridled gratitude and hope. 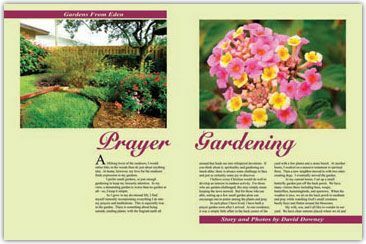 The magazine is divided into 3 sections: nature, scripture, and living. 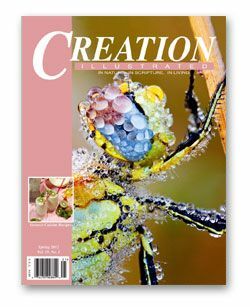 In regards to the nature section, Creation Illustrated has been called the "Christian National Geographic". It is no wonder why. 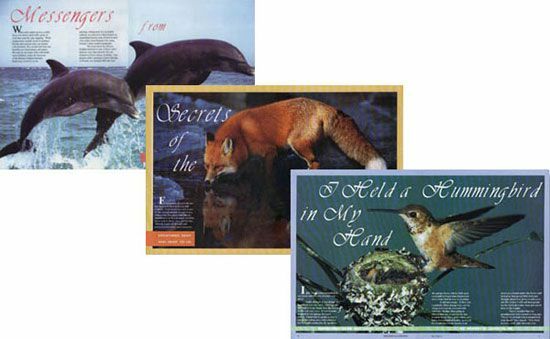 Each issue is packed with glossy, full-color photographs of nature. I was fascinated with all the up close stunning photos of a variety of hummingbirds in the Spring 2012 issue. I think hummingbirds are absolutely fascinating. Did you know that they are the only birds that can fly backwards? In addition to the beautiful photography, the articles are both interesting and educational. I enjoyed the personal tone of the articles. It doesn't read like a text-book. It has the same feel as living-books. The author's love of the topic and his/her first-hand experiences come through and add to the enjoyment of the articles. After reading about Yellowstone and its geysers, my children now want to go visit there for themselves. As I mentioned, there is also a section about Scripture. 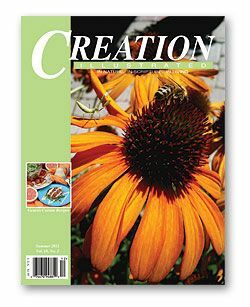 For example, the Winter 2012 issue has an article about stewardship, with suggestions of how to be better stewards of God's Creation and of the resources He has blessed us with. The final section is about living, things such as taking time to appreciate God's Creation and to find stillness among all the busyness. 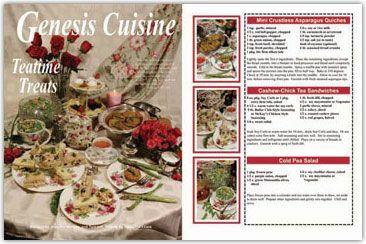 You can also find some great recipes and ads for companies that promote a healthy lifestyle. Of note, is a children's story which makes a great read-aloud and a photo contest for ages 5 - 15, with cash awards. Homeschoolers will appreciate the included Instructional Guide. It is designed to "help students of all ages integrate and embrace the practical spiritual lessons available through the study of God's handiwork. As students personally apply the moral and spiritual enrichment found in nature, they will recognize the character and love of God." 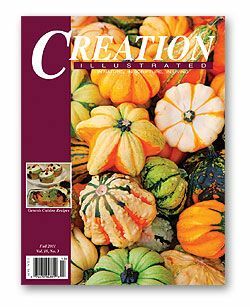 (quote from the magazine) The guide includes comprehension questions, Scripture references, and "make you think" questions. Speaking of "make you think", I appreciate that some of the articles include moral lessons. The Winter 2012 issue has an article about the hummingbird moth. When seeing it, many people think that they are seeing a hummingbird, when actually, they are seeing a moth. It just happens to be a moth who looks a WHOLE LOT like a hummingbird. The lesson in this is - How can you tell the difference between the impostor moth and the real hummingbird? The answer? By knowing the real thing very well. The same applies to God. To quote a brief segment of the article on page 29 - "How can we determine whether Satan is deceiving us or whether God is speaking to us? There is only one way - the same way we can tell whether we are looking at a real hummingbird or a hummingbird moth. We need to know what a true hummingbird looks like, and then by comparing the questionable creature with the genuine, we will know if we are looking at the real bird. So it is with our spiritual life. We need to study the Bible so we can recognize the characteristics of God . . ."
I like these magazines for several reasons. 1. The photography is beautiful. 2. The articles are written by authors who love the topic. 3. It makes learning about nature interesting and is more fun than reading a dry textbook. 4. It is written from a creation viewpoint, without evolution and old-world references being assumed. 5. It includes Scripture references and ties nature back into God and His Creation. 6. The publishers offer a photo contest for children. 7. The instructional guide is a much-appreciated bonus. 8. It offers practical ideas and suggestions of how to be better stewards of God's Creation. 9. It offers practical ideas and suggestions of how to also take better care of ourselves. 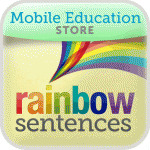 Other apps available from Mobile Education Store for the Ipad. Also for the Iphone. These apps were designed with special-needs children in mind. Read about their story here. I am a big fan of using apps as part of our education. I have recently discovered just how many educational apps are available and just how helpful they can be. I used this app with both my 3 and 10 year old daughters. For my 3 year old, I used it on the easiest settings. For my 10 year old, we set it to the most difficult settings. My 3 year old quickly caught on to the color coding. Putting the blue subject on the blue line; putting the verb phrase on the matching color line, etc. My 3yo liked the cute picture that would accompany each sentence. Very cute little pictures of things young children find interesting - dogs, babies, toys, etc. She was extremely proud of herself each time she got her sentence correct. And she enjoyed watching her puzzle fill up with pieces, each time she set-up enough sentences correctly. As I mentioned, we set my 10 year old's account to the most difficult level. This was the only way that it was at all challenging for her. So I would recommend this app to younger elementary students, maybe Kindergarten through 3rd grade. Instead of having color-coded phrases, she had a set of individual words (with no colors). She had to take the set of words and put them in correct order to make sense of the sentence, based on the picture. Most of the time, she flew through it with ease, quickly figuring out how to make sense of the sentence, using the picture as a guide. There were a few times where she got a little perplexed and had to think it over for a bit before correcting her sentence. 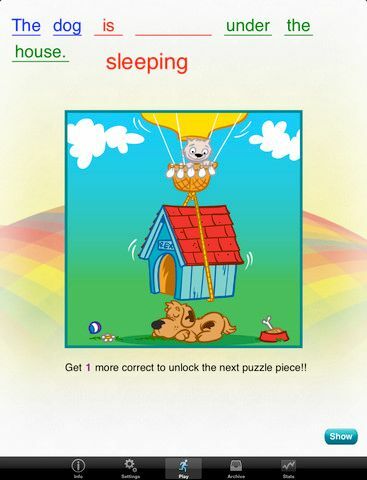 The app is geared to several learning styles. It is visual with the colorful images and color coded sentences parts. It is auditory with the option to record yourself reading the sentence and playing it back. It is tactile, using the Ipad. 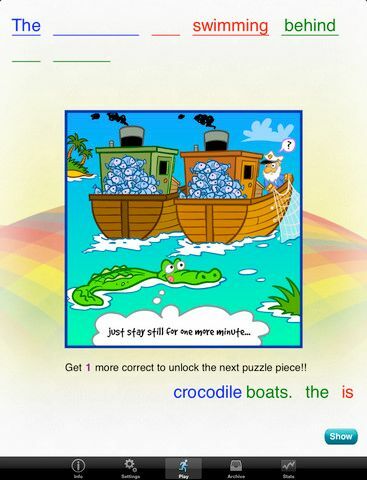 It is rewarding, earning puzzle pieces as you go along. The app is colorful, cute, and easy to navigate. I appreciate that it allows the parent so many options to customize the settings, making it usable for a wider age span. Again, though, I think it would be best fit for about Kindergarten to 3rd grade. After that it will likely be too easy, unless the child has learning disabilities. In that case, this could be a great asset even into the late elementary grades. Read more Crew Reviews here!